We're deep in the heart of winter, but there are signs that spring might not be too far away. There is a ten-minute window of daylight before the sun sets when I leave the office, and the wind has shifted just the slightest, with the barest hint of humidity . While I am still enjoying the hearty soups and stews for which the season begs, I find myself dreaming in anticipation of spring fare. Asparagus, spinach and peas are just around the corner and I can hardly wait. And I start thinking of salads, and other light fare. This orzo, broccoli and pea salad was born out of just such a yearning. It is based on the Marinated Whole Wheat Pasta and Vegetable Salad I wrote about here back in May of 2006. 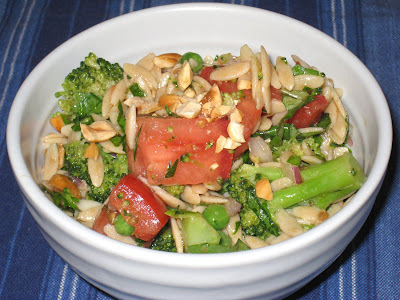 In fact, I used the marinade recipe as written, changed the rotini to orzo, cut up salad tomatoes instead of cerry tomatoes, threw in some fresh basil in addition to the parsley, and topped it with chopped toasted hazelnuts. I wasn't sure whether or not whole wheat orzo would be available here, but I found it at Treasure Island. It's the same brand that produces a great (and the original, I believe) Texmati brown rice - RiceSelect. It is quick and delicious, and makes a great light lunch or dinner. And it lends itself well to mixing and matching with whatever pasta and vegetables you have on hand. And it will tide you over while you wait for those first true spring vegetables to appear.